Specification: 1600cc crossflow engine, Borg Warner Type 35 3-speed automatic gearbox. Original colour 'silver fox' metallic. Price when new £ 1,066 12s 11d. The Ford Capri made its debut at the January 1969 Brussels Motor Show, after four years' development work to produce an equivalent of the American Ford Mustang model for the European market. The name had previously been used for a variant of the Ford Classic in 1961-64. The model aimed to offer a 'sporty' image with an affordable price, and was initially sold as the car you always promised yourself. Mechanically, the Capri was based on the contemporary Cortina range. Capris were built the Dagenham and Halewood plants in the UK, Genk in Belgium, Saarlouis and Cologne in Germany; for the Australian market at Homebush, Sydney, and briefly in South Africa. The model received a 'facelift' in 1972, followed by the Mk 2 Capri being introduced in 1974, and the Mk 3 in 1978. Production ended in 1986, having been concentrated in Germany since 1976. Over 1.8 million Ford Capris were produced. 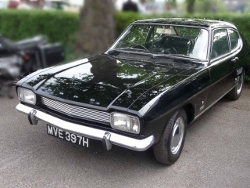 This car was donated to the Lincolnshire Vintage Vehicle Society to mark the 25th birthday of the Ford Capri by Alan and Amanda Horton who provided the following potted history. "The car was given to us by a couple who knew that we collected Capris, as they had no further time, money or space to keep her. They decided to give her away to someone who had. So we took her on and planned a full restoration in future years. Unfortunately, owing to other expenses that arose we undertook a budget respray, hence the reason that she is not in her original colour now. "We have promised in the not too distant future to rectify this problem and any others that arise in her upkeep. In recent years we have taken Clara to numerous Classic Car Shows and she creates a lot of interest, partly due to the fact that she is automatic, which is very rare for this model. " January 2013 - The Capri was moved into the workshop after open day - rather than going back into the museum at the end of the weekend it was decided to put the Capri onto the ramp in the workshop in order to get it running and assess its condition to see if it could be put on the road in the near future and if so what would be required. After removal of the fuel tank and flushing through of the fuel system it was run up - unfortunately it was found that the cooling system was blocked up, after thorough flushing of the system it now runs and circulates coolant. It is now being checked through to see what further work would be needed to return it to a roadworthy condition in the near future.